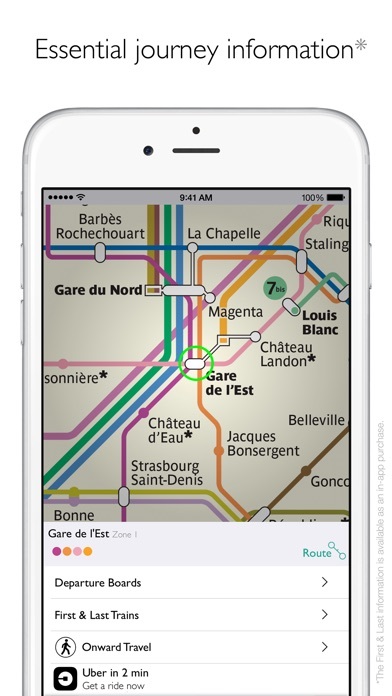 Official RATP map of the Paris metro within an interactive transport app. Paris Metro is the best navigation tool for travelling around the French capital with offline routing, train times and lots of essential journey information. Features: • Interactive map of the RATP Paris metro system, tram lines and RER lines within central Paris. 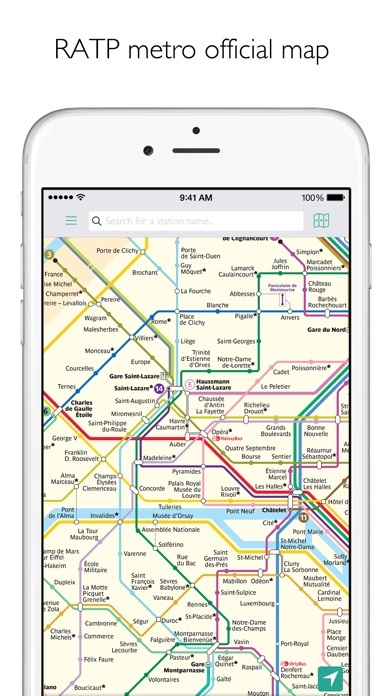 • Easy to search for a metro station or simply view the nearest metro stations to wherever you are in Paris. • Looking for the fastest way to get from A to B? Just use the route planner! • If there’s more than one way to get to your destination we’ll show you the fastest and simplest route so you can choose. • Each route gives details on how long your journey will take and how many metro stations you will pass through. • With step-by-step directions shown on the metro map, travelling around Paris is simple and stress-free. • Plan routes to popular Paris points of interest such as the Eiffel Tower, the Louvre and Notre Dame. • View train times to see how long you’ll be waiting with departure boards for each station. • Save your favourite routes for quick access when on the go. • We’ve teamed up with Uber helping you to book a taxi within seconds and continue your journey after using the Paris Metro. • Live Twitter feed from RATP with helpful travel information. 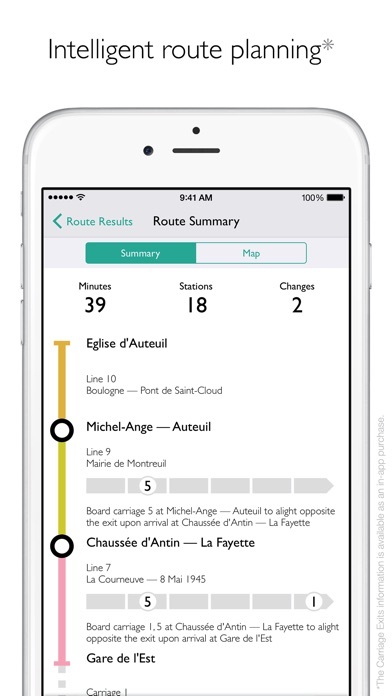 Exclusive Paris Metro features available as in-app purchases: • Starting early or finishing late? Get the First and Last Train Times for stations on the map. • Carriage Exits will save you time knowing which carriage is nearest the exit or platform when you’re changing service. • Remove Adverts We make apps for cities worldwide so if you’re also visiting Hamburg, Berlin or London make sure you check out our other metro maps for these cities, available to download for free in the App Store. Continued use of GPS running in the background can dramatically decrease battery life. 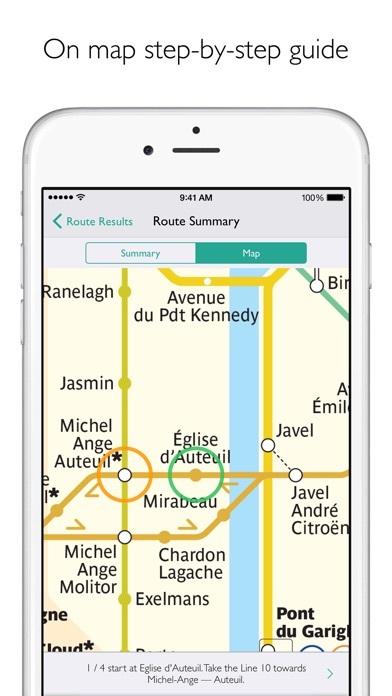 Join Paris Metro and other Mapway apps on Facebook and Twitter – simply search for MapwayApps! Plan. Route. Relax. The major improvement needed is on the planner, and it needs to have the line direction/end stop so it’s easy to tell which direction to get on. What happened to the directions ? Loved the app and it’s easy and user-friendly interface. “Metroing” all over Paris was surprisingly simple. Only reason I rate it as 4-star rather than 5 is because it lacked clarity when switching from metro to RER. Otherwise absolutely fantastic to use. What’s the point of a free app if you can’t route it anywhere unless you pay to unlock that feature? Thank you, thank you, thank you I have no idea what we would have done without this app it was accurate and easy to follow. Purchase your metro ticket and follow the directions especially the part that states which line number and what it is towards. For example it will say line 4 towards Porte de Cignancourt. 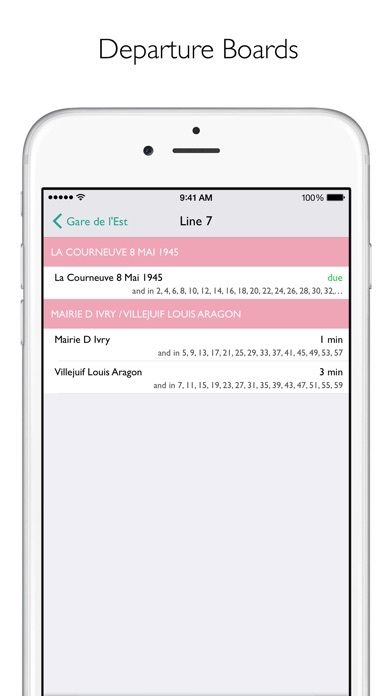 When you get into the metro you will see the line for and color corresponding to the color on the app you look at the final stop which you should see Port de Cignacourt as the last stop and that tells you you are getting on the train in the right direction. This app made it easy and we were certainly apprehensive about using the metro I watched numerous YouTube‘s but until I downloaded this app nothing made sense. We went everywhere on the metro sightseeing all the major attractions for a fraction of the cost of taxis do yourself a favor and download the app. I just got back from Paris. This app was a lifesaver and so easy to use. It was perfectly accurate - I was able to get routes so easily and saved so much time. I cannot recommend it enough. Get around Paris with T tickets cheap easy. Spent two weeks in Paris and used app each day. Enjoy. If stations or routes are closed there is no notice of that in route planner. Not at all helpful!